google-site-verification: google8d8438b214143f71.html Beautiful Quotes: When you’ve done all that you can do. When you’ve done all that you can do. When you’ve done all that you can do, and you still feel like you have so much further to go. When you feel like all that you have to give still isn’t nearly enough. When it seems that you will not be able to keep up everything that needs to be kept up for one minute longer. Stop and breathe. Look, really look at what you are expecting of yourself. You cannot always do it all. You cannot hold everything together perfectly and you cannot be perfectly composed every single day. It’s unrealistic. It’s ok to have “off” days. Bad days will pass just like they always do. There will be a brand new sparking day waiting for you tomorrow. Don’t put so much pressure on yourself. 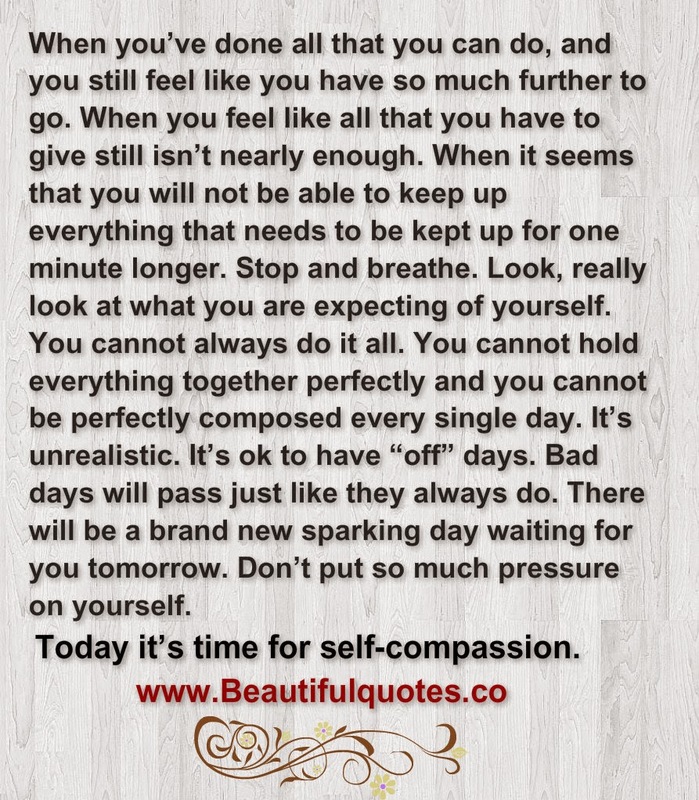 Today it’s time for self-compassion.